This summer, while children enjoy their vacation, team of hihilulu is particularly busy. Because we are very honored to establish a cooperative relationship with Chinese School Les Petits Trilingues in Paris to bring fun Chinese animation into children's Chinese course! The Petits Trilingues summer Chinese class aims to create a fun and productive Chinese immersion for kids. The cartoon series Mouk on Hihilulu platform brings more rich teaching materials to the teachers and provides fresher Chinese learning content for children. So what does the rich multimedia curriculum bring to the Chinese classroom? 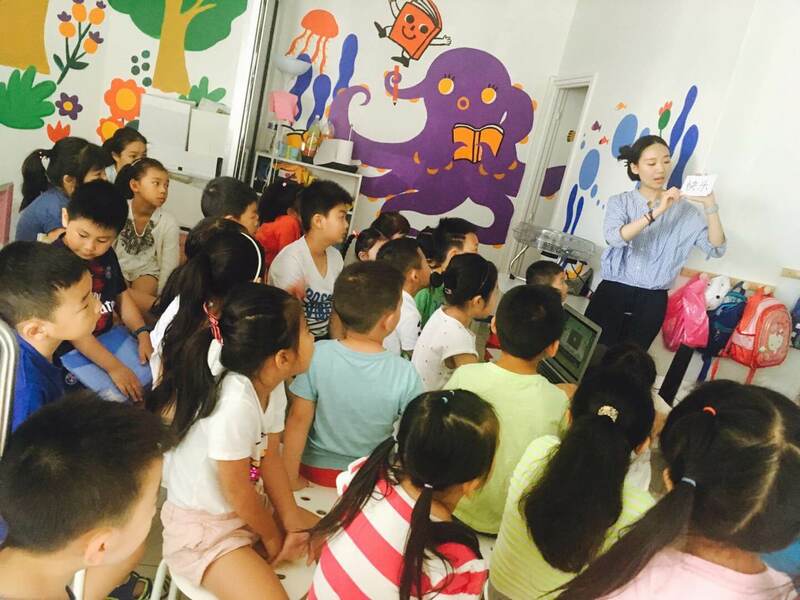 In the 20-day summer Chinese course, children watch half an hour of Chinese animation every day, accompanied by Mouk's music and stories. By exposing in animation stories, children learn new Chinese characters with the teacher. They watched cartoon, and teacher gradually explained new words to children. Following the animation story of Mouk, children learned and memorized Chinese content. For children in Chinese class, diversified course content can not only help them understand story in the vivid Chinese scene, but also repeatedly watch the animation content in the classroom after class to effectively deepen their learning memory. Teacher's accompanying animation teaching, coupled with interactive Q&A, makes the traditional classroom form more vivid and interesting. Teachers also mentioned that animation video teaching has improved the children's sensitivity to Chinese, which is commonly known as practicing children's listening of foreign language, while animation content also stimulates children's interest in learning. So that Chinese learning becomes more interesting. In the classroom, children tried to imitate how people or animals speak Chinese in cartoon that allowed them to communicate naturally in the context of Chinese. For children of different ages and different language levels, Mouk animations can help children to understand and unconsciously memorize words they heard in story. For children of lower grades, cartoons are particularly attractive. Children watched and were self-motivated to imitate. They participated more actively in the question and answer than usual, and carefully read and repeat story. Middle-aged children can understand most part of story. After learning new words, they try to describe the storyline and use new vocabulary to rephrase story, that enhanced their learning effect. Learning is a process that requires constant repetition and memory. Each review will help children deepen their understanding of new language. Animation and gamification exercises are the best way to attract children. The results of this collaborative experimental course showed that children need a complete environment to learn language. It is not enough to just attend classes in the classroom. Consolidation review after class is even more important. Hihilulu creates a full range of language resource to help children learn Chinese, not only to accompany their learning, but also to create a multi-faceted and interesting cultural environment for them to let children learn happily! We will continue to bring more new content and front-end news of experimental courses. Let’s learn Chinese with hihilulu!